“Paris with the snow falling. Paris with the big charcoal braziers outside the cafes, glowing red. At the café tables, men huddled, their coat collars turned up, while they finger glasses of grog Americain and the newsboys shout the evening papers. The buses rumble like green juggernauts through the snow that sifts down in the dusk. White house wall rise through the dusky snow. Snow is never more beautiful than in the city. It is wonderful in Paris to stand on a bridge across the Seine looking up through the softly curtaining snow past the grey bulk of the Louvre, up the river spanned by many bridges and bordered by the grey houses of old Paris to where Notre Dame squats in the dusk. It must have been a particularly cold winter (something like this year's) when he wrote that, because there's not always snow at Christmas in Paris, no matter how romantic and enduring the image. In reality, it seems to snow approximately once every few years or so, sometimes twice in a particularly cold winter, but many winters not at all. It's even more rare to see the snow stick. I feel a certain connection to Hemingway, not just as a writer in Paris (ha! you see how subtly I lumped myself in the same category as Hemingway?! ), but even more because of close geography. When he and his first wife (first of four), Hadley, moved to Paris in 1921, they lived at 74 rue du Cardinal Lemoine, just off of the Place de la Contrescarpe in the 5ème arrondissement. Rue Mouffetard, the market street that juts off the Place de la Contrescarpe, is both one of the oldest and now most charming market streets in Paris. Believe me, when you shop and eat and drink your way up and down this narrow, cobblestone lane, buying gourmet tea, tasting fresh Belgian waffles, trying on cashmere sweaters, and stopping in at a chic café, the word "squalor" will not come to mind. There are not one but three cheese shops ranging from better-than-you'll-ever-see-in-the-US to high-quality-even-in-France. There's a plaque to Hemingway that still stands on the building where he lived. Hemingway evidently loved cats, thinking them very smart and emotionally honest (that's two points against Hemingway) and he was famously tickled by his annual Christmas candy mouse. It's probably easier to understand why he loved eating candy mice so much when you realize that he claimed to eat real, formerly-live pigeons from the nearby Jardin du Luxembourg, which he would – supposedly, by his own claims -- hunt down, kill (with his bare hands? ), and put in his baby’s stroller. This stinks of urban legend to me. But what is true, according to a 1999 recollection of his then-100 year old friend from the Ritz hotel in the Guardian, is that he hunted pigeons in the Paris suburbs: Real pigeons who had feathers plucked so they couldn't fly straight would be released from a box to be blasted away. Yes, I have tasted pigeon before. Yes, the French do occasionally have it on the menu. Yes, I'd rather have chicken. Our family’s Paris Christmas tradition sometimes includes hunting pigeons, as well, but in a different sense. Instead of feeding us, we like to feed them when we go out for a walk along the Seine after a tiring morning of gift-opening -- though not this year, as we are actually spending the holidays in the US after six Christmases away. Other than pigeon for dinner, newsboys, and cheap rent in the heart of the Latin Quarter, Hemingway's Paris is not that far off from my Paris. He loved cafés, exploring the city, and strolling the bouquinistes along the quai of the Seine’s Left Bank, and so do I. My best friend here operates one of them (occasionally, when she feels like opening up), and they're fun for browsing. Hemingway would have been able to find some real deals on old books. Now the books are generally curated and expensive, including -- and especially – those written by Hemingway. Of all Hemingway's works, none is more closely associated with Paris than A Moveable Feast, in French called Paris est une Fête, which translates more literally as "Paris is a Party" than as "Paris is a Feast." After the terrorist attacks, sales of this particular book absolutely skyrocketed, most likely as people wanted to ground themselves in a peaceful Paris of old. 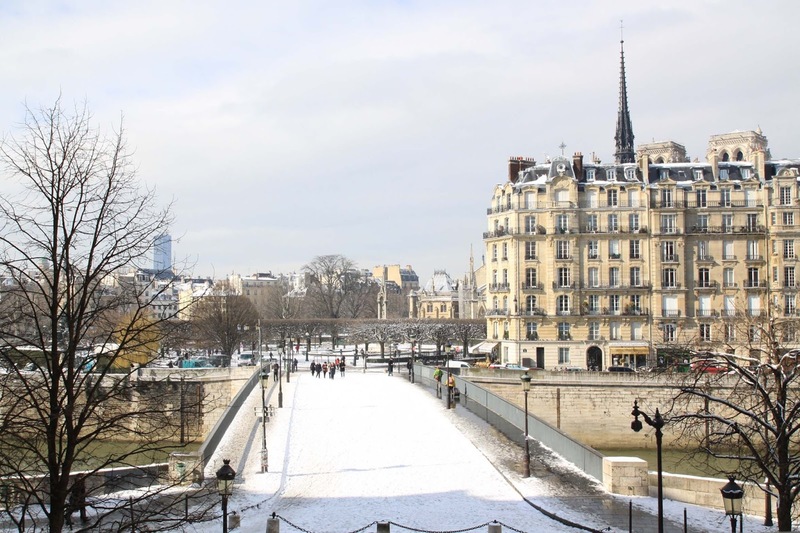 It was like a literary salve, the balm to mitigate Parisians' collective pain. Even now, in happier times, there is something special in the French psyche about this book, and about Hemingway in general. There are many things about Paris that have changed in the years since he lived here, but I think he would recognize Christmas here but, perhaps, find it less lonely now. Domaine du Velay is a cows' milk blue cheese that, at about 30€ per kilo, is relatively expensive, especially for pasteurized cheese. That's because it's actually quite a fine one, despite my marked prejudice against pasteurization in general (I'm looking at you, America). It's creamy and led with gorgeous, fuzzy, gray-blue-green divets. If I could make that into a shag carpet, I would cover my room in it. I'm not sure I'd have many visitors due to the funk, but I really am quite taken by the blue streaks here. The texture is not just creamy but rather silky and melt-in-the-mouth. The flavor, of course, has that characteristic blue tang and also a sweet, fruity finish. It's a lovely blue, great with winter pears, in a salad, or just slathered on fresh bread. Domaine du Velay is made in the town of Beauzac, in the department of Haute-Loire, in the Auvergne-Rhône-Alpes region. The name comes from the fact that La Fromagerie de la Vallée de l’Ance that produces it is in the heart of the Velay mountains, which in turn are part of the Massif Central, the mountainous region just south-east of dead center of the hexagon. The milk comes from the Haute-Loire nearby Loire, and Puy-de-Dôme. Because the milk is pasteurized, Domaine du Velay is produced year round and is easily transported for sale throughout France. It could even legally be imported to other countries, like the US (hint, hint). The addition of the penicillium roqueforti to the forming cheese, along with the salting and turning of the cheese, are done by hand, slowly maturing over many weeks with careful, daily attention. Besides the lovely rhyme of the title "The Heming-way" with the cheese "Domaine du Velay", the real connection is that I purchase this thin sliver of cheese on the thin sliver of the rue Mouffetard in my neighborhood, not only a street beloved by Hemingway that appears in A Moveable Feast but also the one that leads to the Place de la Contrescarpe, where Hemingway lived and where the plaque in his honor now stands. While this exact cheese shop probably didn't exist when he lived here almost 100 years ago, it's certain that some cheese shops closely resembling it would have existed then along this market street -- albeit with more squalor.